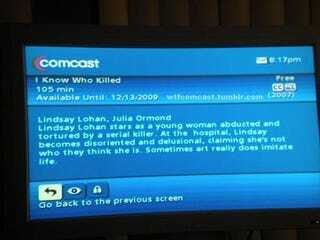 This astute synopsis of Lindsay Lohan's ultra-meta pièce de résistance isn't a fluke—no, over at Comcast, movie summarization has been elevated to an artform. That, or their whole staff has a raging pill habit. Either way! UPDATE: Deadspin sheds some light on the source of Comcast's listings.